Chicago's most romantic restaurant features fondue dining and live classical and flamenco guitar. We are open 7 days a week. Fondue dining – cooking at the table - is a great way to give your family and friends a unique experience. 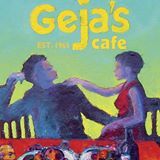 Geja's features an extensive, moderately priced wine list, with many selections by-the-glass. Reservations: Please call 773.281.9101 or use the form above-right. We would be delighted to help plan your private party. We accept all major credit cards. Because of safety concerns, we ask that children be at least 10 years old.